A California man being questioned over the deaths of his wife and unborn son after their bodies washed up on a local beach has now been charged with their murders. 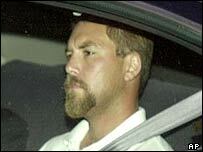 Scott Peterson - whose wife Laci disappeared while eight months pregnant - protested his innocence as the charges were read out in court in Modesto, California. He had been arrested shortly before the bodies were identified by DNA tests on Friday. The double murder charge against Peterson means he could be sentenced to death. A spokesman for the district attorney said a committee would review all the evidence in the case before deciding whether to seek the death penalty. The disappearance of Laci Peterson sparked intense media interest, with rewards of up to half a million dollars offered to those who had information relating to the case. Laci, a 27-years-old teacher, disappeared on 24 December from her home in the agricultural town of Modesto. Her husband denied having anything to do with the disappearance of his wife, saying he had been away on a fishing trip. Then last week the decomposed body of a baby and later a woman, were found washed up in San Francisco Bay, 145 kilometres (90 miles) north of Modesto. DNA tests showed that the remains were those of Laci Peterson and her son. The cause of death for both remains unknown. 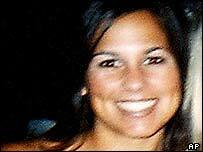 Police said at the time of his wife's disappearance that Scott Peterson was not considered a suspect. However the couple's home, car and boat were searched. Investigators also said there appeared to be no clear motive for the crime. Mr Peterson later admitted he had been having an affair, although he said that his wife had known and that they were trying to salvage their relationship.